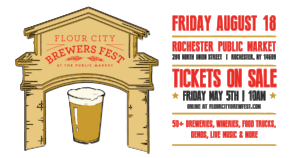 Rochester, N.Y. – In just the blink of an eye, VIP Tickets have sold out for this year&apos;s Flour City Brewers Fest. 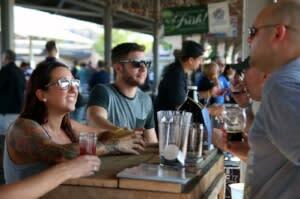 A larger quantity of VIP tickets were offered this year, due largely in part to the expansion of the festival’s venue, the Rochester Public Market, and the planned increase of featured breweries. By 11:10am Friday morning, festival organizers had posted the sold-out notice on the event’s Facebook page, additionally stating that General Admission tickets will go on sale this Friday, May 5th at 10am, and once again, the festival will be conducting a handful of random VIP Ticket Upgrade promotions over the next couple months. To be eligible, guests must simply purchase their GA tickets online prior to the TBA drawing. An order name/number will be drawn at random and their entire party will instantly be upgraded to VIP status. Winners will be notified via registered email. Guests are encouraged to purchase their tickets early, as the random drawings could occur at any time. This year’s event will feature hundreds of the finest local, regional, and state-wide craft beers available for sampling, including many specialties and small-batch brews. In addition to great craft beer sampling, guests will be able to enjoy cider and wine tastings, live music, and a myriad of local food trucks offering a variety of culinary delights. The Flour City Brewers Fest is hosted by Rohrbach Brewing Company and is celebrating its 22nd year, its fourth of which at the Rochester Public Market. With a General Admission ticket, guests will receive event access at 6pm, a festival sampling glass, and access to all beverage vendors, food trucks, and live music. Designated Driver tickets will also be available for purchase online, and DD guests will be permitted to enjoy a small selection of non-alcoholic beverage vendors, as well as access to food trucks and live music. All guests, including DDs, must be 21 or older to enter. All ticket tiers will be available for purchase online via the tickets page at http://www.flourcitybrewfest.com/. Tickets can also be purchased in person at both Rohrbach Brewing Company locations, Rochester-area Wegmans, Beers of the World, and AJs Beer Warehouse, beginning June 1st. Whether you are a “hop-head” or prefer a well-balanced malty brew, we can promise there will be no shortage of options this year . The Flour City Brewers Fest is presented for the benefit of Holiday Outreach, Inc. and the New York State Brewers Association.